Last night I went to the Red Sox game with my husband, Gus, his friend, Karl, and Karl's wife Tina. It was a good game though the Red Sox lost 4-3 to the Yankees. But no matter what, Red Sox vs Yankees is always an interesting game. Something funny happened in the middle of the game. It was in the 7th inning when Eric Hinske hit the ball off the wall. Suddenly one of the fans, a guy, ran on to the field and took Robinson Cano's hat and ran around. Security chased after him and finally tackled him and Gus said that the guy definitely went to jail. They don't tolerant fans that break the rules, and that is why they don't show fans doing that on TV. Gus can't believe that I was at game four of the 2004 ALCS (American League Championship Series). People, including him, are still talking about it. It was one of the greatest games in Red Sox history, the one where Dave Roberts stole second in the 9th. That year, the Red Sox were baseball world champions, the first time they won since 1918. The curse was gone. 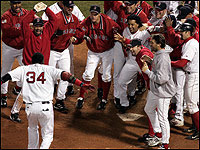 The Boston Red Sox can be the World Champions again at anytime. They look good this year. Keep believing people!